Buy your own gun at the Nike Store here. Fun and very nerdy Boo Busters T-Shirt! More cool retro t-shirts at Threadless. Starting today, 3 limited edition t-shirts will be available at The Standard Hotels in LA, NYC, and Miami. 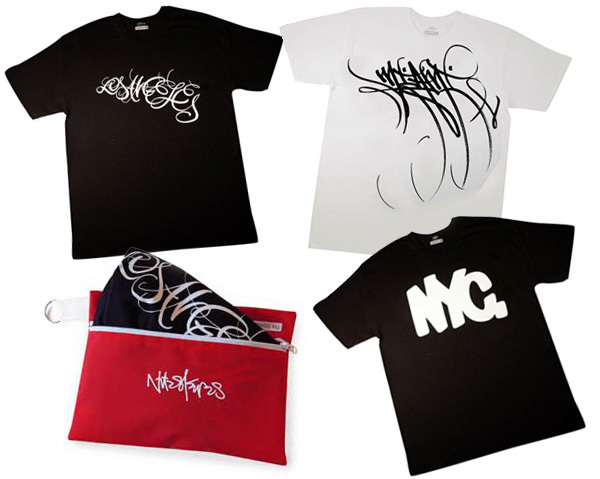 Andre Balazs has commissioned three contemporary legends, Natas Kaupas, Eric Haze, and Jose Parla to design these t-shirts for their respective cities, and only 1500 of each design have been produced. I really like the varying styles of typography and for once it’s a promotion where you’d actually wear the stuff being given away. But then again I shouldn’t have been surprised by this, as all the artists and designers involved have excellent portfolios of work. Read More at Not Cot. New to Karmaloop, this sweet WESC Space Fade Tee. I love the retro Tron-esque design and colourscheme and for $30, it’s a gift. A nice little surprise from ,Threadless. When you order one of their excellent prints, you get this guide of things to do with the huge tube the print comes shipped inside. Nice. Another great t-shirt from Glennz Tees, get “evolution” for $20.